For the first impression there is no second chance. This is what we know not only clever sales psychologists, we know from our own experience. And this applies not only to people, but also to houses and apartments. Here too, the first few minutes decide whether a buyer is seriously interested in the property or not. Another fact: almost 80% of all people lack the imagination to imagine an unfurnished room with furniture or a furnished room with their own furniture. In the 1960s, American actors began to make their selling properties for set designers to be the best. Since the 1970s, homestaging has become an integral part of the successful marketing of real estate in the US. In the 1980s, staging sales real estate first captured the British market and continues to be used there with great success. In the 1990s, Scandinavia also discovered homesting. Currently about 70% of all houses in Stockholm are “staged”. Since 2006, homesting has also established itself in Germany, and more and more house sellers and brokers can profit from the advantages. Residential properties are so neutralized that it is easier for the potential buyer to visualize his own individual ideas. Unwanted real estate is staged in such a way that the prospective customer feels directly addressed. Homesting can be partially 10% -15% higher purchase prices! 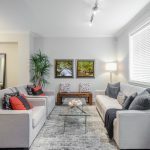 The cost of a professional home staging can be up to 3% of the sales price, depending on the complexity and size of the object.